It started with running—then she found triathlons. From triathlons she discovered a passion for long distance swimming. Now Priority Health Amy Larson free-styles through miles of open waters like Lake Michigan and the San Francisco Bay. In 2012, Amy found herself volunteering at a 5K and was inspired seeing so many people of every shape and size crossing the finish line. With her glucose levels hitting the pre-diabetic range, she was determined to run her first 5K, but couldn’t see herself crossing the finish alone. Luckily, Amy had a strong network of supportive friends. Amy’s sister Allison is one of the many people who have helped Amy stay on track. Allison signed them up for the Irish Jig 5K in East Grand Rapids to keep them accountable and give them an end goal. Between hitting the gym and following the Couch to 5K app, Amy started her fitness journey strong. But soon the magic of her new routine wore off and the mind games kicked in. Amy lost hope. She recalls she didn’t enjoy running and her mind was telling her she would never be able to finish her first race. Thankfully, Allison saw her potential and encouraged her to keep going. She pushed Amy to remember their commitment to running the race they had signed up for. Not only did Allison’s motivation help Amy make it to race day, it helped her finish, too. Amy and her sister proudly crossed the finish line and Amy now knew that she could do so many things even when people, herself included, said she couldn’t. Not long after the run, one of Amy’s friends encouraged her to try a super sprint triathlon. Amy figured she could ride a bike, run and she knew she was a decent swimmer, so she signed up. Amy not only finished her first triathlon, but placed fourth. After one race, Amy was hooked. Since 2014 she has completed 29 triathlons, 10 half marathons, an Iron Warrior Dash (16 miles with 28 obstacles), two half Ironmans and a full Ironman distance aqua bike (114.2 miles). Not to mention she swam across the Straits of Mackinac (five miles) and competed in the U.S. Masters Swimming Open Water National Championships’ (a 9.2-mile swim) in Chattanooga, Tennessee. She’s also traveled to California to participate in the “Escape from Alcatraz” triathlon. Through this process Amy has made great friends and connections all throughout the Grand Rapids area. She regularly trains with “The Gold Members,” a group of her friends who all wear gold jackets when racing together. 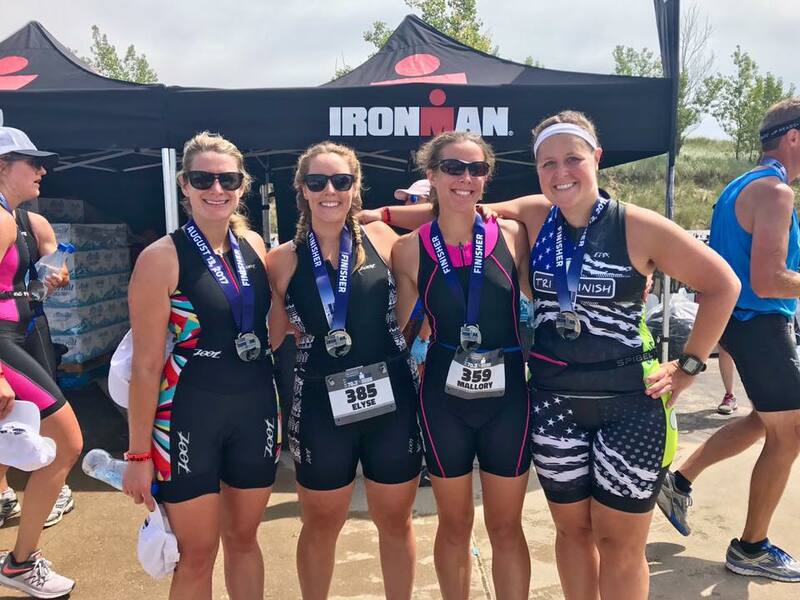 She’s also found comradery in GRIT Life, a community of people living healthy lifestyles through movement, nutrition and mindfulness, along with participation in indoor cycling classes to build endurance for spring and summer triathlons during the winter months. 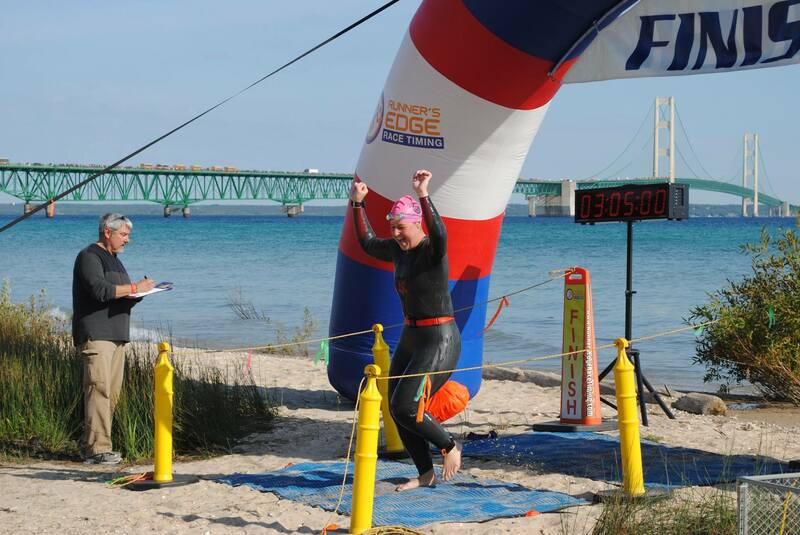 Last but not least, Amy is on the East Grand Rapids Masters Swim Team that meets three times a week year-round. As if competing in all of the triathlons and long distance swims weren’t enough, Amy is training to swim around Charleston, South Carolina (12 miles total) this year. If her track record is any indication, it’s a goal this Priority Health Champion will definitely meet with her friends and fellow Champions cheering her on. Best of luck and keep swimming, Amy!